Finally… the definitive version of Saving Private Ryan arrives on Blu-ray which once again revisits the Stephen Spielberg masterpiece. What makes this release so special, besides the amazing special features that accompany the movie is the high definition video and sound quality. Even though the film is 22-years old, it is has dated considerably well and is definitely a must have Blu-ray for anyone’s collection. I won’t dwell on the story too long (most people should already know this) but it involves Captain John Miller (Tom Hanks) who leads a small squadron of soldiers into enemy lines to find Private James Francis Ryan (Matt Damon), the last surviving son of the Ryan family.Not only is this one of the most realistic war movies to date but the battle scenes are quiet spectacular, especially the beginning which highlights the allied invasion of Normandy and is still as powerful as it was yesterday as it is today. The movie is superbly cast, especially with Hanks leading the film and all the emotions and experiences of the characters they play are thoroughly brought to life with an unnerving realism. Spielberg should be commended on the entire movie experience that truly honours those who died in World War II and unlike some movies that glorify war, Saving Private Ryan reinforces that although several brutalities were committed, the power and determination of mankind prevailed during this blight on history. Video, video and video! The transfer from film to Blu-ray is easily the most impressive that I have seen all year, considering the age of this movie. Of course, Spielberg always uses the latest and greatest state of the art technology and this has helped preserve the quality and allow for a flawless transition to Blu-ray. The colours are muted, however this is more to portray the era as opposed to a flaw and the images are exceptionally sharp and detailed. There is at times some grain, however this poses no issues whatsoever. The lossless DTS-HD Master Audio 5.1 is phenomenal and truly makes good use of any surround sound system and the first battle in the movie could only be considered reference quality that truly immersed me and my neighbours into the film. Apart from the all the sounds and screams of battle, the background sounds are implemented perfectly as is the crystal clear dialogue. Brilliant stuff! Extras! As mentioned, this is the definitive version of Saving Private Ryan and Paramount have truly outdone themselves with this release which includes everything from research into the movie, behind the scenes and bringing it all together from video to sound. Final Thoughts? 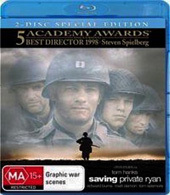 It’s understandable why Saving Private Ryan won so many awards and rather than just make another Blu-ray release that cashes in on the success of the original film, Paramount have created a true keepsake for your collection from the outstanding video and audio quality to the impressive list of special features that you give you a true backstage pass. However without the powerful and engaging story, Saving Private Ryan would just be another war movie… but it’s far from that!